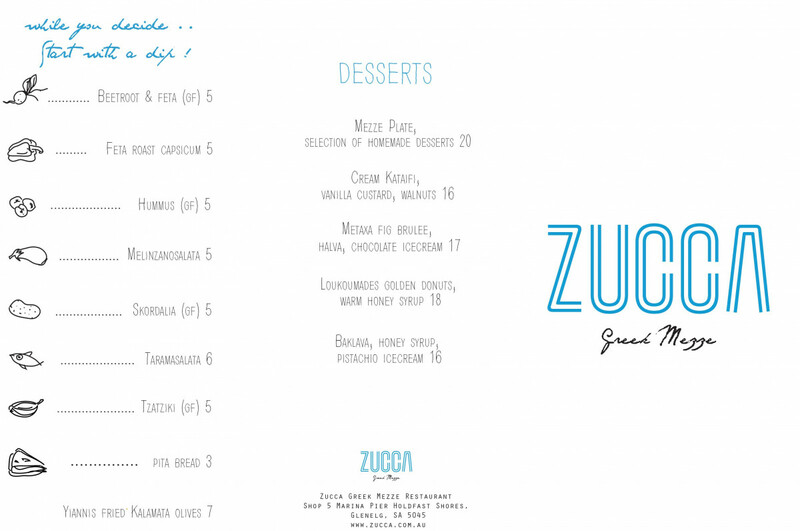 Zucca, where ocean views meet modern Mediterranean Greek cuisine. 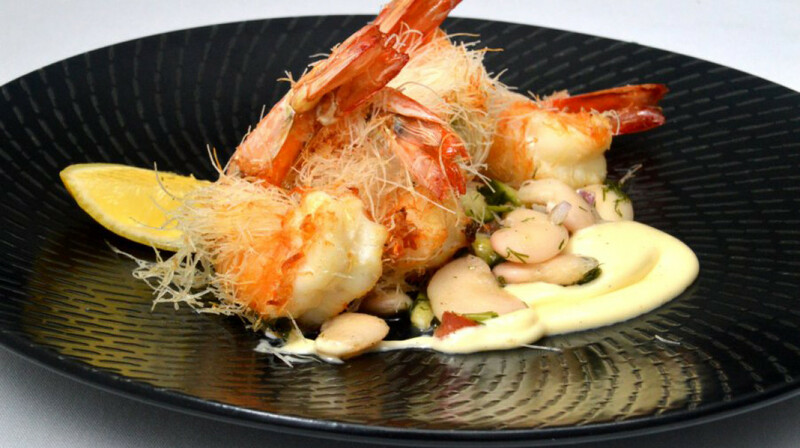 On the Marina Pier at Holdfast Shores, Zucca takes in stunning views and houses three of Adelaide’s best chefs. 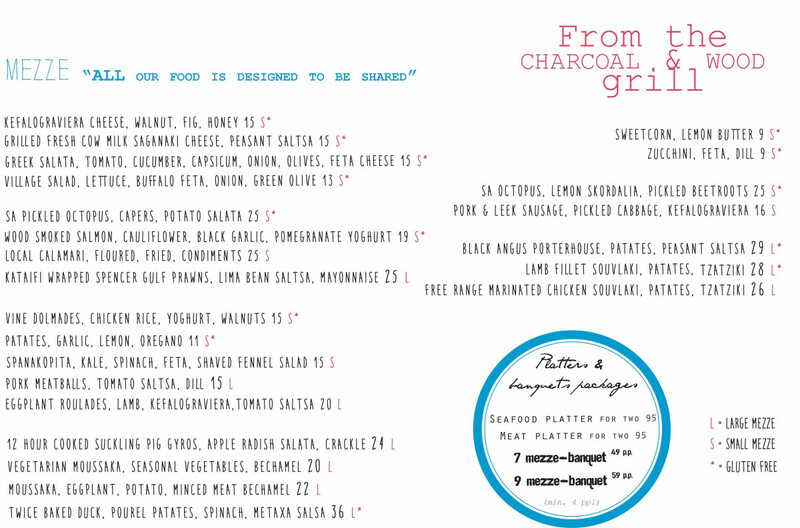 Peter, Dave and Adam have designed an irresistible menu inspired by the best of the Med, using great local produce. 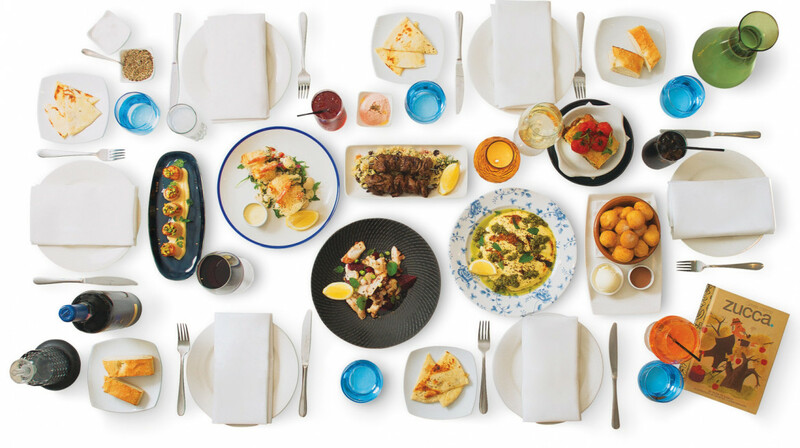 The selection has been kept simple and is cooked in the same fashion as homes all over Greece. Mezze dishes are designed to be shared, so opt for pita bread and dips while you peruse the menu and pick favourites for your group. 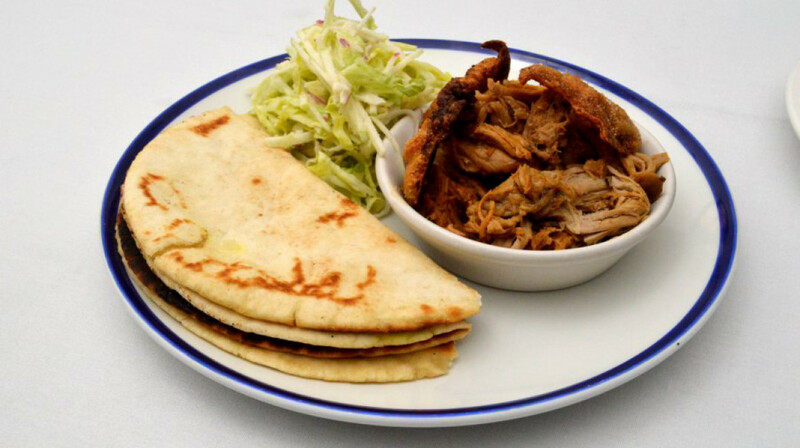 Tuck into pickled octopus, wood smoked salmon and 12-hour- cooked suckling pig gyros. From the charcoal and wood grill, there’s juicy black angus porterhouse and mouth-watering sweetcorn with lemon butter. 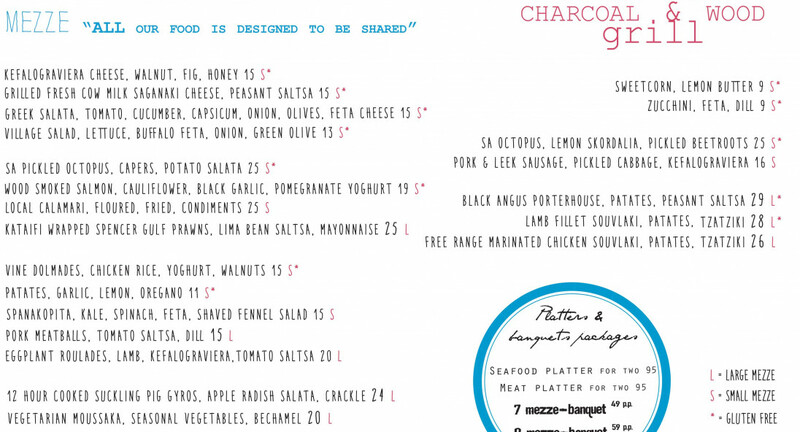 Zucca has an extensive drinks list, including spirits, beers, wines by the glass and of course, the obligatory ouzo! Great food. Great location. Great service. Great price. The Venue, service and the company was excellent and we will certainly venture to the Greek Zucca restaurant again soon. It’s amassing. Thanks for good service and food as well. My three companions and I thoroughly enjoyed our shared seafood and meat platters. The quality - and certainly, the quantity was there. The salad, crisp roasted potatoes and dips were excellent accompaniments. As an afterthought, the only improvement I would suggest would be to provide more serving spoons/tongs. Had I asked for them, I am sure the friendly staff would have obliged. I loved our dinner out with my family - we don’t get to go very often all together so this was a lovely treat! We all loved the prawns small dish, but the duck was fantastic as well. Would 100% recommend here to anyone for some authentic Greek food. It’s hard to put into words how awesome the food was. There were a lot of “Oh yep. You need this.” as we tasted the goodness. Absolutely divine, best Greek food ever. Thanks Zucca and First Table. We had such a lovely dinner at Zucca. Braved 46 degree heat to get there and it was well worth it. Staff were attentive and each dish was better than the next, the chef knows what he is doing. The dolmades were somehow a standout, served with a delicate sauce and walnuts. If you haven’t been here before, give it a go! 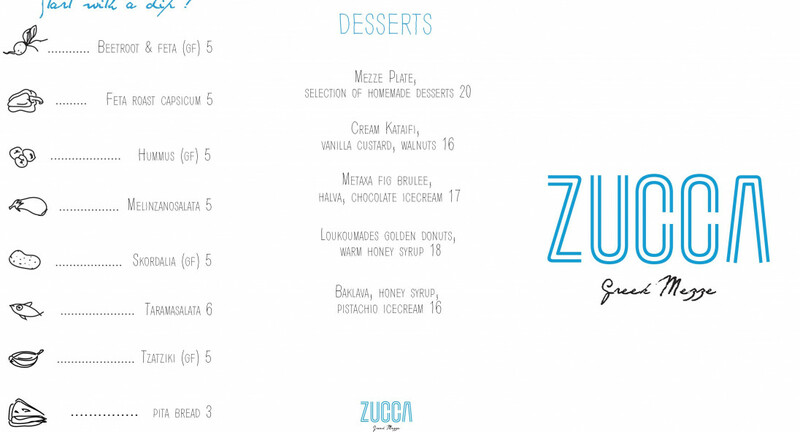 We thoroughly enjoyed our dining experience at Zucca. 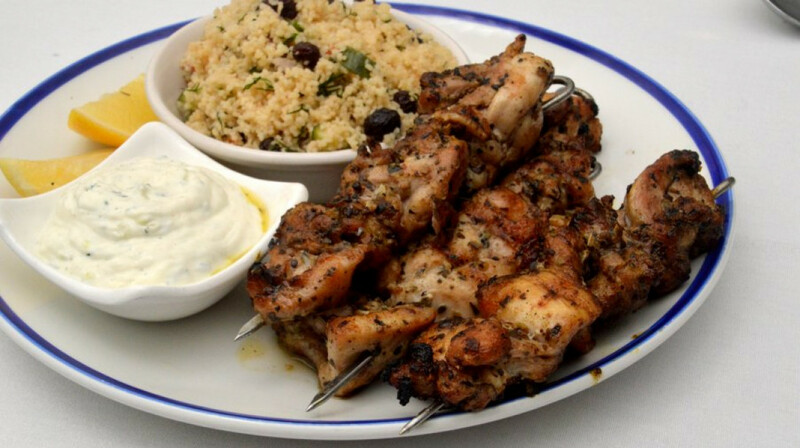 From the tasty dips & pita bread starter, to the fili wrapped prawns & lamb souvlaki. All enhanced by the traditional Greek salad. Added to the experience was a view of a sun drenched beach & sea. Attentive staff made sure we had all we needed. We’ll be back! 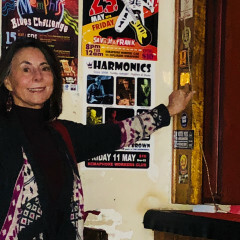 My husband & I went to Zucca's on the 16th January 2019. We were sat right near the window overlooking the ocean which was very nice. The waitress was very pleasant & helpful. We shared the roasted capsicum & feta dip with pita which was excellent. The greek salad came next & that too was very good. I then had the grilled octopus & my husband had the calamari. His was excellent however my octopus was quite tough. I talked to the waitress & chef about it & they offered me another dish which the chef recommended, the large fried prawns. I actually preferred the octopus as it had much more taste than the prawns, it was just a pity that some of the pieces were so tough. Next time I would try the octopus again but have the chef only lightly grill it. Over all it was a good experience as we had not been here before. The chef & waitress were very nice & quick with the service. We dined here to celebrate our daughters 16th birthday. We ordered the 7 mezze banquet, as the last time we went with friends we did the 9 dishes and couldn't finish all the food! Well we also struggled to finish the 7! The serving sizes are generous, and every single dish was delicious! We especially loved the scallops, cooked to absolute perfection, and the calamari was the best we have ever had. Fresh from the sea. 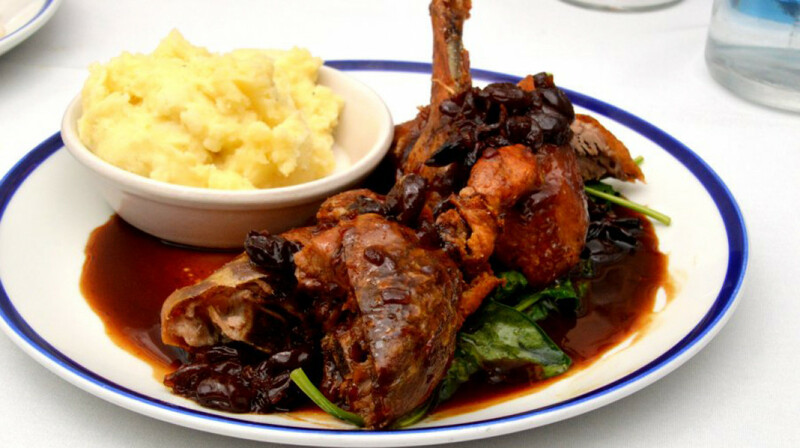 The service was friendly and faultless;the staff know their menu and recipes and are able to describe each dish should you need clarification on anything. The view is perfection, being situated in a prime location, looking straight out onto Glenelg beach. We love this restaurant and will definitely return. Highly recommend to everyone. This place is a gem. Fantastic food, beautiful atmosphere, great views. Very enjoyable meal and we will be back! Enjoyed the 7 mezze banquet very much as we got to choose 7 items from the menu. Lots of food to please everyone and the biggest eaters. Saganaki cheese was my fav but everyone else opted the duck as their fav. Excellent service and beautiful sea views. Delightful place to bring guest visitors. We were a bit worried when we first walked in and saw the tired and unmaintained decor. But the staff were lovely, and the seafood platter for two was just delicious, and way more food than the two of us could ever eat. The scallops and the potatoes were particularly well cooked. We enjoyed our meal and we will be back again. 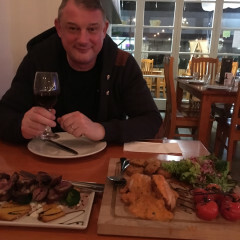 We had a wonderful time at Zucca, the service was outstanding (one young girl looking after the restaurant not letting anybody wait and clearing tables quickly did an amazing job), the food was plentiful and so tasty, so much that we couldn't fit in dessert. The view was lovely and great company always wins. Can't wait to come back and dine again. We had a fantastic platter of seafood and a bottle of Champagne as we watched the amazing sunset. To make it very very special, It was my Birthday! Really enjoyed the seafood/meat platter. 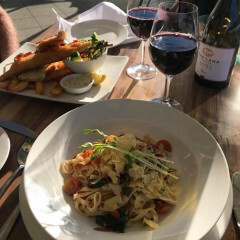 The perfect time to dine at this restaurant located along the Maria is around 6:30pm - 7:00pm, so you can enjoy the lovely views of the ocean and the radiating sunset. We enjoyed the 9 course banquet where we got to try a variety of dishes on offer. All of which were delicious! A big thankyou to the Chefs for tantalizing our tastebuds last night, and to the waiting staff for their friendly and attentive service! We'll see you all again very soon. Eating out on a Wednesday night is not something we do often, but as we had to travel down to Glenelg to do some business we thought it would be nice to eat out while we were down there. We were greeted at Zucca Greek Mezze with a friendly smile and by someone who knew all about First Table which was great. Our table for two with the ocean view (although it was dark) was comfortable and the restaurant was warm. Even though we were the only people in the restaurant at the early time we felt relaxed and welcomed. The food was exceptional along with the wine and we would most definitely eat there again. Thank you for a lovely experience. Had a lovely dinner at Zucca. Unfortunately all wines were not available, unfortunately the ONE that I liked was not available (it was disappointing because it was my birthday!). The waiter made other suggestions and ended up giving me some lemonade to sweeten the wine that I had chosen. Food was excellent, there was only one waiter on the floor when there could have been more. All in all, a nice evening. From the dips to entree and mains Greekalicious meazzalicious! And that’s coming from a Greek! What an experience. Sunset at the Marina then dinner at Zucca Greek Mezze. The food was sensational.. The Meze platter was one of the most enjoyable Greek meals we have eaten. .The staff helped us to select from an amazing menu. Every course was delicious. The Baklava served with Pistachio and coconut ice-cream was amazing. Zuccas was divine, as a Greek this is definitely one of the best Greek food restaurants in Adelaide..
Amazing food, beautiful views of the shoreline. Perfect spot for dinner. Best skordalia in Adelaide, Opa!!! Food was grand and service was good. Amazing food, service and view ! We will be back ! 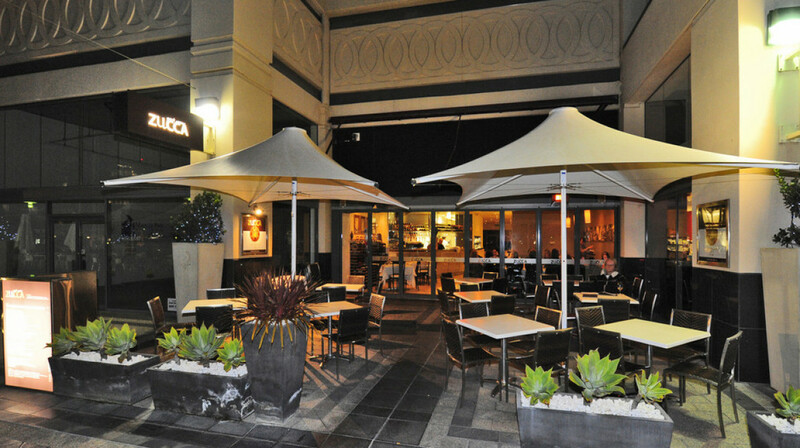 We had an enjoyable experience at Zucca Greek Mezze on Friday night. The service was friendly and prompt, the atmosphere was good and the back drop of the sun setting over the ocean was idealistic. The menu had a good selection of interesting and tasty dishes, we chose 5 dishes between the three of us which was maybe one too many, however there were more on the menu that we would have liked to try. Delicious food and great service, would highly recommend to friends and family. Will definitely be back! This was my second visit to Zucca and I wasn't disappointed. The food and service were very good and the restaurant. I will definitely be back. My husband and I really enjoyed our 3 course meal at Zucca Greek Mezze. As we entered this light and airy restaurant we were greeted by friendly, welcoming staff and seated at a table in a prime spot by the window. Our delightful waitress, Brittany, was attentive to our every need and it was obvious that she enjoyed her job. The food was all perfectly cooked, delicious and attractively presented. We couldn’t fault any of it. We would definitely go back to this restaurant and recommend it to others. Al little slow to get our food. Waitress asked how we would like our food bought out to us, due to it being shared plates we asked to have one or two dishes bought out at a time, so we could enjoy our food hot, but that did not happen it all came out at once, food was great. Good service in a busy restaurant. Food was spot on. We ordered the meat platter for 2 which can easily feed 3. I enjoyed the Greek beers, of which there is a good variety. We were greeted with a friendly smile and seated at a table with a gorgeous view. Our order didn't take long to be place in front of us. A prompt entree was given and were checked to see how drinks were. A great selection of seafood on the platter for 2. Too full for dessert. Very enjoyable meal and already know what we wish to order on our next visit. Gorgeous setting watching the sunset. Great food. We will be back. Thanks guys.